To add an announcement message that appears at the top of the dashboard you can create a file at /etc/ood/config/announcement. (md|yml) or /etc/ood/config/announcements.d/any_file_name.(md|yml). On each request the dashboard will check for the existence of this file. If it exists, the contents will be converted using markdown converter to HTML and displayed inside a bootstrap alert. Fig. 1 Example of the Dashboard announcement. will prevent SSH login to Ruby nodes and and Ruby VDI sessions. Warnings about the announcement file being missing may be present in users’ nginx logs. Despite the warning the Dashboard will still function normally without those files being present. 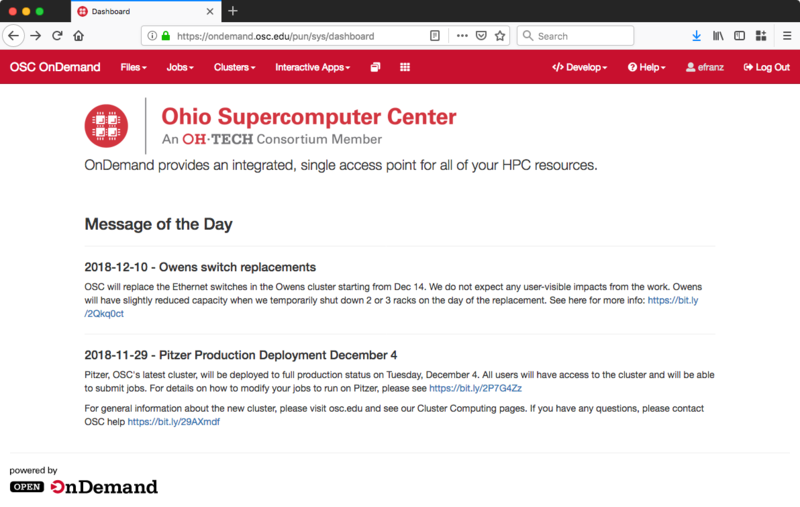 You can configure the Dashboard to display the /etc/motd file on the front page - the same file that is displayed when ssh-ing to a login node. Fig. 2 Message of the Day appears in the body of the index page. We recommend setting this in /etc/ood/config/apps/dashboard/env. You can customize the logo, favicon, title, and navbar colors of OnDemand. We recommend setting these environment variables in /etc/ood/config/nginx_stage.yml as YAML mappings (key value pairs) in the mapping (hash/dictionary) pun_custom_env. Alternatively you can set these in the env files of the dashboard and the apps. Currently only the dashboard uses the colors in the navbar. OOD_DASHBOARD_TITLE The title appears in the navbar and is controlled by the environment variable $OOD_DASHBOARD_TITLE. The default value is “Open OnDemand”. OOD_DASHBOARD_LOGO The default value for OOD_DASHBOARD_LOGO is /public/logo.png and this should be the URL to the logo. By default if you place a logo.png at /var/www/ood/public/logo.png it will be accessible via the URL https://your.ondemand.institution.edu/public/logo.png. OOD_PUBLIC_URL The favicon is expected to exist at the path $OOD_PUBLIC_URL/favicon.ico. For a default OOD installation the favicon will be located at /var/www/ood/public/favicon.ico. Use white text on black background for navbar. OOD_NAVBAR_TYPE By default we use inverse for this value, which specifies to use Bootstrap 3’s inverted navbar where text is white and background is black (or dark grey). You can set this to default to use black text on light grey background if it fits your branding better. These URLs can be specified, which will appear in the Help menu and on other locations of the Dashboard. We recommend setting this in /etc/ood/config/apps/dashboard/env. The Files menu by default has a single link to open the Files app in the user’s Home Directory. More links can be added to this menu, for Scratch space and Project space directories. Adding more links currently requires adding a custom initializer to the Dashboard app. Ruby code is placed in the initializer to add one or more Ruby Pathname objects to the OodFilesApp.candidate_favorite_paths array, a global attribute that is used in the Dashboard app. using map we turn this array into an array of Pathname objects to all the possible project directories the user could have. 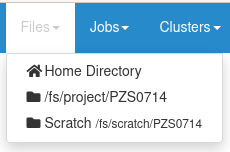 On each request, the Dashboard will check for the existence of the directories in OodFilesApp.candidate_favorite_paths array and whichever directories exist and the user has access to will appear as links in the Files menu under the Home Directory link. Fig. 4 Shortcuts to scratch and project space directories in Files menu in OSC OnDemand. You must restart the Dashboard app to see a configuration change take effect. This can be forced from the Dashboard itself by selecting Help → Restart Web Server from the top right menu. If you access the Dashboard, and it crashes, then you may have made a mistake in ood.rb file, whose code is run during the initialization of the Rails app. This is not yet used in production at OSC, so we consider this feature “experimental” for now. This whitelist is not enforced across every action a user can take in an app (including the developer views in the Dashboard). Also, it is enforced via the apps themselves, which is not as robust as using cgroups on the PUN. In /etc/ood/config/apps/shell/env set the env var DEFAULT_SSHHOST to change the default ssh host. Otherwise it will default to “localhost” i.e. add the line DEFAULT_SSHHOST="localhost". This will control what host the shell app ssh’s to when the URL accessed is /pun/sys/shell/ssh/default which is the URL other apps will use (unless there is context to specify the cluster to ssh to). “Job Composer” implements these steps by providing the user job template directories and the ability to make copies of them: (1) Copy a directory, (2) Edit the files, and (3) Submit a new job. A template consists of a folder and a manifest.yml file. The folder contains files and scripts related to the job. The manifest contains additional metadata about a job, such as a name, the default host, the submit script file name, and any notes about the template. notes: Notes about the template, such as content and function. name The name of the template folder. script The first .sh file appearing in the template folder. notes The path to the location where a template manifest should be located. Some sites have the home directory auto-create on first ssh login, for example via pam_mkhomedir.so. This introduces a problem if users first access the system through OnDemand, which expects the existence of a user’s home directory. In OnDemand <= 1.3 if the user’s home directory was missing a non-helpful single string error would display. Now a friendly error page displays. This error page can be customized by adding a custom one to /etc/ood/config/pun/html/missing_home_directory.html. See this Discourse discussion for details. Apps contain a manifest.yml file that specify things like the title, icon, category, and possibly subcategory. The Dashboard searchs the search paths for all the possible apps and uses the manifests of the apps it finds to build the navbar (navigation menu) at the top of the page. Apps are placed in the top level menus based on the category, and then in dropdown menu sections based on subcategory. Then an app that specifies “Reports” as the category in the manifest would appear in the “Reports” menu. In OnDemand 1.4 we changed the behavior by adding a new boolean variable NavConfig.categories_whitelist which defaults to false. If false, whitelist mode is disabled, and the NavConfig.categories only exists to act to enforce a sort order and all apps found with a valid category will be available to launch. The default locale is “en” and the default locale file can be found at /var/www/ood/apps/sys/dashboard/config/locales/en.yml. To customize, you can copy this file (or create a new file with the same stucture of the keys you want to modify) to /etc/ood/config/locales/en.yml and modify your copy. motd_title: "Message of the Day"
The key welcome_html ends with _html and Rails will trust the value of this string as valid HTML. The motd_title on the other hand will be sanitized. The welcome_html interpolates the variable logo_img_tag with the default logo, or the logo specified by the environment variable OOD_DASHBOARD_LOGO. You can omit this variable in the value you specify for welcome_html if you prefer. You can use a custom locale. For example, if you want the locale to be French, you can create a /etc/ood/config/locales/fr.yml and then configure the Dashboard to use this locale by setting the environment variable OOD_LOCALE=fr. Do this in either the nginx_stage config or in the Dashboard env config file. We will be localizing many more strings in the future. We currently display an alert message at the top of the Dashboard mentioning that we don’t currently support the Safari browser. This is because of an issue in Safari where it fails to connect to websockets if the Apache proxy uses Basic Auth for user authentication (on by default for new OOD installations). If you ever change the authentication mechanism to a cookie-based mechanism (e.g., Shibboleth or OpenID Connect), then it is recommended you disable this alert message in the dashboard. Where version defines the version of the JSON schema used, timestamp defines when this file was generated, and quotas is a list of quota objects (see below). You can configure the Dashboard to use this JSON file (or files) by setting the environment variable OOD_QUOTA_PATH as a colon-delimited list of all JSON file paths in the /etc/ood/config/apps/dashboard/env file. The default threshold for displaying the warning is at 95% ( 0.95 ), but this can be changed with the environment variable OOD_QUOTA_THRESHOLD. A block must be equal to 1 KB for proper conversions. Where block_usage and file_usage are the disk resource usages attributed to the specified user only. For each user with resources under this fileset, the above object will be repeated with just user, block_usage, and file_usage changing.